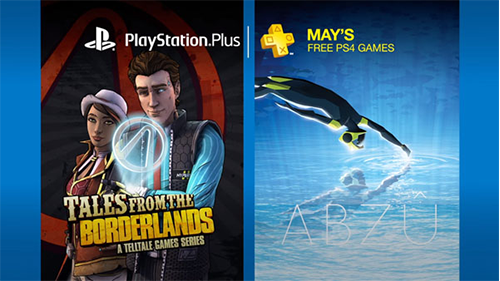 Starting Tuesday, May 2th you can get these upcoming games for free if you have a PlayStation Plus subscription. We've got a pair of awesome games on PlayStation 4, while the usual "eh" games are making up the PlayStation 3 section. But hey, I'm really looking forward to the Vita games as well, even if they're not jaw-droppingly amazing. Tales From the Borderlands was one of the biggest surprises in modern gaming. It's an awesome "choose-your-own-adventure" Telltale game set in the world of Borderlands. The first episode has been free for a long time but getting access to the entire season will be a satisfyingly awesome bonus. Heads up, this is a Mature rated game by the ESRB, just like any other entries in the Borderlands series. If you're familiar with its inspiration, then it shouldn't surprise you that Abzu was developed by former employees of That Game Company who was repsonsible for Journey. While the game didn't set the world on fire like its predecessor, Abzu is still a gorgeous game that nails a relaxing and visually impressive experience. 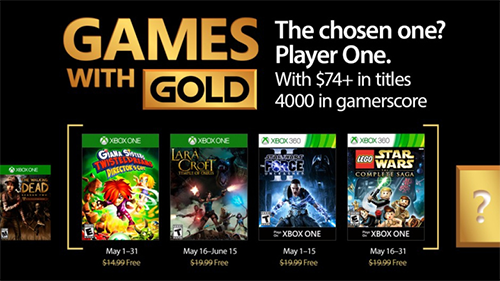 Since Monday, May 1st you can access the first wave of games on Xbox One and Xbox 360, if you have a Gold subscription on Xbox. The second wave of games begins on Tuesday, May 16th. Unlike last month's Xbox Games with Gold and this month's PlayStation Plus lineup, all of the games are appropriate for younger gamers, with the strictest rating being a T for Teen to go alongside Lara Croft and the Temple of Osiris. Whlie I can't speak as much to Giana, a game that found a small audience on the Nintendo eShop, Lara Croft is an awesome spin-off to the Tomb Raider series. Both Xbox 360 titles are non-canon Star Wars spinoffs, to help you get into the spirit with May 4th gets here. Though there have been better games in the series to release, Xbox 360's LEGO Star Wars: The Complete Saga is exactly what it sounds like, LEGO's complete collection of the earlier Star Wars films lays a solid foundation for the LEGO games to come in the future. PlayStation Plus stands tall for me this month, strictly on the merits of its PlayStation 4 games. If you're talking older games, Xbox's Star Wars titles stand tall up against the uninteresting PlayStation 3 and Vita titles, aside from the awesome Type: Rider. Which lineup stands out to you? Do you subscribe to either platform? Comment below!